South Webster sophomore Gwen Messer struck out 20 Huntington batters in eight innings of work in the Jeeps 3-2 victory over the Huntsmen. Minford senior Reid Shultz (#24) hit a walkoff single Saturday to push the Falcons past Athens in the bottom of the eleventh inning. In the bottom of the eleventh inning, Minford senior Reid Shultz decided enough was enough. On the first pitch of his at bat, Shultz picked up one of his two hits and his lone RBI in a single to center field which drove in Elijah Vogelsong, the game winning run in their 6-5 victory over Athens on Saturday. Up until that point in which Athens and Minford (9-0, 5-0 SOC II) played over half a second game, the Falcons had used three pitchers, including Shultz who pitched the final three innings while allowing just a single hit. Vogelsong didn’t only score the game winning run in the marathon game, he had the biggest day at the plate for Minford by going 3/4 with two walks in six plate appearances and a game high two RBI. Nathan McCormick, Ethan Lauder, and Brayden Davis, each picked up an RBI as well for the Falcons Saturday. The Portsmouth Trojans (4-7, 2-1 OVC) picked up a lopsided non-league win over Valley Saturday, 14-1. Cassie Potts led the Trojans day at the plate with a game high three RBI in her three plate appearances. Madison Perry followed Potts efforts closely by finished 3/4 at the plate with a walk and two RBI. Portsmouth’s Kylee Montgomery finished Saturday’s game on the mound for the Trojans by throwing 6.0 IP, allowing a single hit in the bottom of the sixth and striking out six Indians batters. Brooklyn Weeks picked up the Indians only hit through six innings of play that ended Montgomery’s no hitter. Weeks scored the Indians only run in that same half inning. 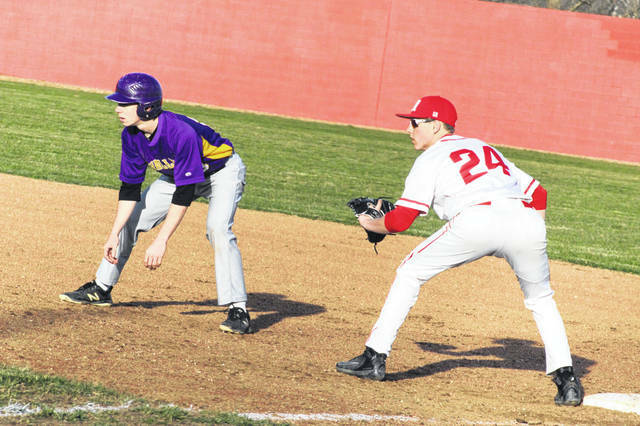 Minford baseball wasn’t the only team to have a walk off win, Saturday. With a 2-2 count in the bottom of the ninth, South Webster’s (10-4, 4-1 SOC II) Rease Hall singled in Bri Smith, the go ahead run, to elevate the Jeeps winners over Huntington, 3-2. Hall’s RBI was her lone hit of the game as she finished 1/2 with two walks. Smith scored the game winning run, but she also hit a solo home run in the bottom of the fifth inning. Mack Keller also picked up an RBI on her lone hit for the Jeeps. In the Jeeps second game of the day against the Huntsmen, their bats came alive much more so than they did in game one. 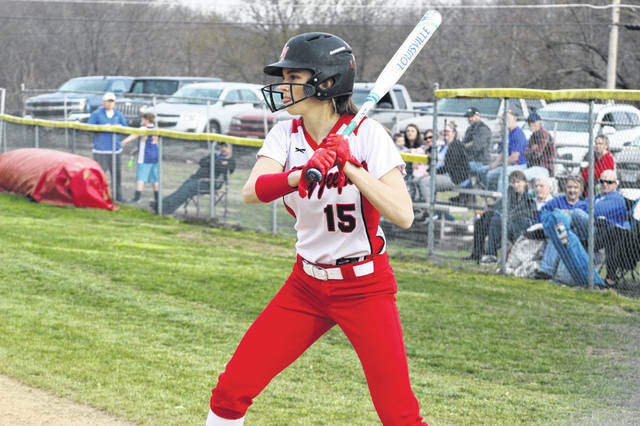 Mack Keller led the way at the plate for the Jeeps by going 4/5 in her five plate appearances with a game high four RBI. Hunter Sizemore pinch hit in the fifth inning for the Jeeps, a time in which she would clear the bases in a bases loaded situation to bring home three Jeeps base runners to cap off a five run fifth inning. Rylee McGraw gave up just one hit and zero earned runs in her 4.0 IP while walking just ine batter. In Green’s (6-5, 4-1 SOC I) first game of their road double header with North Adams, the Bobcats nearly gave up a seven run lead before ultimately closing out game one with a one run win, 8-7. Ava Jenkins led the Bobcats at the mound and at the plate in game one. From the mound, Jenkins went the distance with 7.0 IP with eleven hits allowed with just two earned runs. At the plate, Jenkins finished 3/4 with a walk in five plate appearances to go along with a team high two RBI. Charli Blevins, Kasey Kimbler, and Cass Kellogg each also finished with an RBI a piece in their game one win. In game two of their doubleheader, Green took an early lead over North Adams and unlike game one, they never looked back. Jenkins was perfect from the plate by going 5/5 with two RBI and four runs scored. Kerston Sparks delivered a game high three RBI while going 2/4 at the plate in game two while Kimbler also finished 3/5 with two RBI. From the mound, Gracie Daniels pitched an excellent game by allowing just three hits and no earned runs while striking out six North Adams batters in her six innings of work. The East Tartans (2-8, 0-5 SOC I) fell to Manchester Saturday 5-1 in their first game of their double header. Hannah Ginn picked up the lone hit and scored the lone run in the Tartans loss Saturday.